Land loans are used to purchase raw land, agricultural property, recreational land, and vacant lots. They differ from traditional property loans because lenders perceive the collateral to be less secure and the loans to be riskier. Lenders will typically ask for higher down payments up to 30% or more and charge higher fees/interest than typical mortgages. Local Financial Institution Land Loans Local buyers who want to purchase farmland, recreational land or a building lot. USDA Rural Housing Site Loans Low to moderate income families who want to build a primary residence on a rural lot. SBA 504 Land Loan Business owners who want to acquire land for a commercial enterprise. Seller Financing Buyers who can’t qualify for a more traditional land loan. Land Company Loans Buyers who buy through land brokers who want to use the built-in financing. Home Equity Loans Buyers who have equity in their personal residence and want to use it to purchase land. Land loans are generally used to either finance property that has not yet been built upon or hasn’t been built upon in any substantial way. This includes lending for purchasing agricultural and similar acreage, recreational land, mining and energy-producing land, commercial parcels, and vacant building lots. Land loans are not used to purchase an existing property. In some cases, land loans are based on plans to build on the property. In other cases, like in the case of farming or ranching, it’s to turn the land into productive use. In still other situations, it’s merely to acquire a parcel that may be used simply for recreation and/or investment. Since there are different types of land loans, there are different types of borrowers that they’re best for. Builders and developers often get land loans to build condos and homes on with the hopes of selling them. Individual buyers may purchase land so they can build their dream home. Farmers may purchase land to grow their crops, build agricultural structures or set up other related businesses. Businesses use SBA land loans for commercial use. “Land loans” is a broad term and there are several types of land loans to consider. They’re all used to purchase land but are offered by different providers like local banks, the SBA, credit unions, and more. 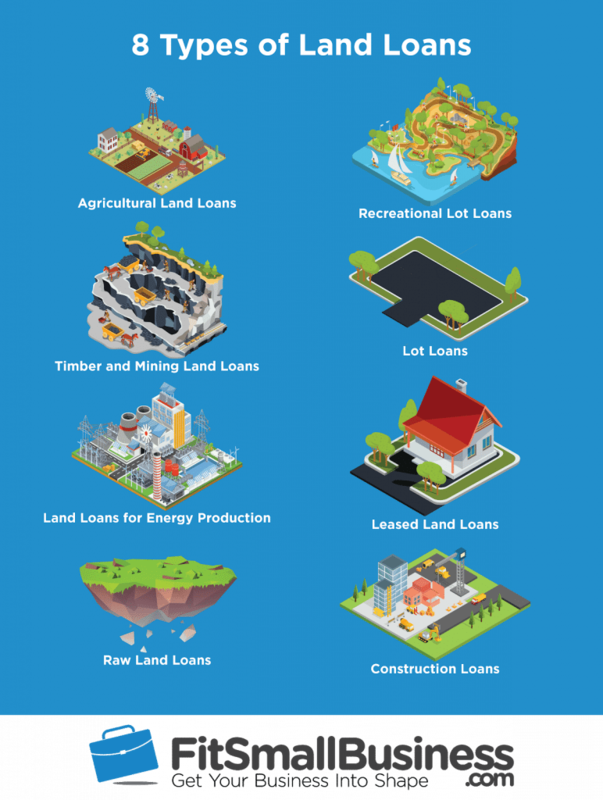 These different types of land loans are used for a variety of purposes including commercial, recreational and agricultural uses. Most land loans come from local banks and financial institutions since they are the most familiar with the area and the nature of the parcels being considered. This is particularly true in rural areas. So, make your first stop to seek out local banks, credit unions, and local savings and loans to see if they offer land loans. These loans are right for buyers who want to deal with someone local that knows the area and who they may already have a business relationship with. They’re generally used for purchasing recreational land, farming land and land in which to build a home or development. Rates and terms vary greatly depending on the intended use and type of property being financed. Loan terms as short as 7-years to a maximum of 30 are available, loan-to-value is normally at least 70%, while some lenders have programs currently running as low as 3%. Many programs have restrictions on how small or how large a parcel might be. With larger parcels, like agricultural land, minimum values may be expected (ie. $300,000 or greater property value). This is very much a local search process. Turn to local banks, savings and loans, and credit unions. Since programs and the types of properties each institution is willing to finance vary, shop around at multiple local lenders. Wells Fargo is a good place to start if you’re looking for a land loan, especially if you already have a banking relationship with them. USDA Section 523 and 524 loans, also known as Rural Housing Site Loans, are intended for low-income and modest-income buyers who want to acquire a lot on which to build a primary residence. They are right for you if you live in a rural area and meet the income requirements. They aren’t right for developers or builders who want to sell the property since they’re required to be owner-occupied. They also won’t work for people who want to build commercial structures or a business on the property. Borrowers in areas that are considered rural in character and have populations up to 35,000 are eligible to apply. These programs are intended for eventual refinance to a traditional mortgage by the borrower after construction of the residence. So, the loan term is short, generally 2 years. Section 523 loans have a 3.25% rate, and Section 524 loans have market rates based off of the current prime rate. Down payments range from 0% to 1.5% of the purchase price. The borrower’s income must be at or below the median income for the area and the property being purchased must be intended for your primary residence. You can find the median income in your area by going to the Census website and clicking on the chart or the table which displays median income by state. USDA loans are available through many local financial institutions. If a local USDA office is available, some offer direct applications. Check out the USDA site on funding, which includes links to resources and how the process works. Under the Section 504 program, the Small Business Administration (SBA) will consider lending on land that will eventually be used for a business operation. SBA loans are available for land used to construct factories, office buildings, restaurants, etc. Multi-unit buildings such as hotels and apartment buildings are sometimes considered. These loans are generally right for business owners who want to purchase land and use it to build a commercial enterprise. They’re not right for individuals who want to build a personal residence and they’re not right for the recreational use of land. The SBA 504 loan program combines two loans (one from a lender, one from a CDC) that can be used to buy land that will be used for commercial activity, owner-occupied commercial real estate, and other fixed assets like equipment. It has stipulations that other land loans don’t require. The lender portion covers up to 50% of the loan, the CDC portion covers 40%, and the borrower is responsible for the remaining 10%. Once the land is purchased, you must use 60% or more of it for your own commercial activity and by year 10, you must use 80%. You must show how the purchase of the land will create new jobs or enhance public policy goals in the area. Currently, the rule is that one job must be created or retained for every $65,000 of funding. This increases to one job per $100,000 borrowed for small manufacturers. In lieu of this, you must demonstrate how the purchase will benefit loan policy such as minority businesses or environmental conservation. The project itself will serve as collateral, but personal guarantees are often required. A business plan for the project, with financial projections, is expected as part of the loan application process. Many local lenders – particularly commercial lenders – offer SBA loan products. Check with local financial institutions to see their offerings. Since this type of loan comes with specific qualifications and fees, we recommend reading our SBA 504 loan article. If you own a home or an investment property and have a home equity line or are willing to obtain one, consider borrowing the money on your existing property rather than trying to secure a land loan. It’s usually easier to obtain and use a home equity loan or a line of credit than many land loans. Home equity lines of credit are right for borrowers who already have a line of credit (LOC) with available funds or can obtain one on their personal residence or investment property. They can then use it purchase land to use for personal use, recreation, agriculture, development or business. Keep in mind that 10-20% of equity must remain in the property after your mortgage and LOC. Rates for home equity loans and lines of credit vary according to the amount of equity in the property, how much is borrowed, and the credit of the borrowers. Currently, home equity rates are as low as 4.5%, and the rates are generally variable. Repayment is usually 10 years. If there is sufficient equity in the primary residence or existing investment property to cover the lending, credit score requirements may be as low as 620 (check your score free here). LTV on the primary residence, after pulling the line of credit or being approved for a home equity loan, will be 80%-90% depending on the lender. Home equity loans and home equity lines of credit are available at nearly every bank and credit union but you need significant equity (at least 30% – 40%) for this to make sense. If you’re shopping for a home equity line of credit, you can reach out to one lender at a time hoping you find a good deal. 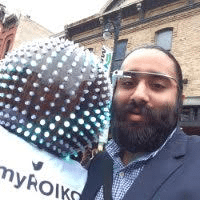 Or, you can visit an online marketplace, like LendingTree, and review offers from multiple lenders at once. Save time, shop smart, and find a HELOC that fits. Often, sellers will take payments on a lot or parcel of land, which is known as seller financing. This doesn’t require an outside lender because you are paying the seller directly. Seller financing is fairly common on raw land, particularly in rural communities. This is often right for buyers who can’t qualify for another type of land loan. Rates and terms on seller-financed deals vary greatly because you are negotiating directly with the seller. That said, expect to pay a higher than market interest rate since that’s the incentive to the seller to offer the owner financing to you. Additionally, while you might be able to negotiate a 20-year or 30-year repayment (amortization) schedule, expect a balloon payment for any remaining balance in the 5- to 7-year range. One of the great features of owner financing is that sellers will typically not “qualify” you in the same way a financial institution does. So, even if you can’t qualify for a traditional mortgage, a seller might be willing to extend credit to you. Seller financing also comes in many forms, like the land installment contract, which is very secure for the seller. If you’re interested in seller financing, ask the sellers if they would consider an owner financed deal. The worst thing that can happen is that they decline. Perhaps they’ll offer it, but with very restrictive terms; or, perhaps they’ll offer an owner-financing situation that rivals anything a financial institution can offer. For a more in depth look at this land loan option, check out our ultimate guide on seller financing. Depending on where you buy, many sellers of land are companies or real estate agencies that offer parcels in volume. In many cases, they will offer financing as part of the purchase agreement. These loans are right for buyers who find a piece of land and want to finance it from the same company that’s selling it. The types of land vary and can be used for building a house, agricultural or sometimes even commercial purposes. Rates from land companies will vary, but don’t be surprised to see rates a bit higher than market, mainly because of the ease of financing. Down payments tend to be low, ranging from $0 down to perhaps 5% down, again in an attempt to encourage buyers. Terms as long as 20 years are common. Land companies are often very liberal with their qualifications. Some don’t require any credit checks or other forms of qualifying other than the down payment. The land is what’s important and it’s used as collateral. To find land company offerings, simply conduct a Google search on the area which you are investigating. An example might be “Colorado Land” or “Colorado Land Owner Financing”. There are also national sites like United Country Real Estate that have offices in each state. Lenders perceive land loans as riskier investments because the collateral doesn’t generate income or provide a roof over one’s head. It’s more likely that the buyer will default on their land loan. Lenders mitigate the risks by requiring higher down payments, charging higher fees and interest rates and expecting a quicker payback of the loan. Lenders know that they can foreclose on land if the borrower defaults, but they will have more difficulty in selling it to recoup any losses. There is less demand for vacant land than developed property, particularly if the parcel is in a rural area with little to no income-producing or development likelihood. Additionally, they may scrutinize the borrower more carefully and/or look for additional collateral to help reduce perceived risks with the loan. Many elements go into the approval for a land loan. As noted above, the intended use for the land is among the first considerations. Other considerations include the size of the land, as well as its value and if it will be income producing or not. Of course, lenders will consider the parcel, its value, physical characteristics, and whether it’s income producing in the approval equation. Lenders will consider what is being paid for the property, and more importantly, what analyses like an appraisal suggest it’s worth. Getting a good buy is important because you’ll have equity already built in. Lenders will look at the size of the parcel and what the land might best be used for. Typically, smaller parcels are easier to develop so they’ll get favorable treatment. So, if the loan is for a 5-acre parcel slated for a single family home, it will be looked at more favorably than 1,000 acres of very rural recreational land with no development potential. If the parcel will generate income such as being farmed, developed in the near-term, leased, etc., it will be perceived as far more secure than raw land that produces no income. The parcel type is the nature of the land itself along with its zoning. Again, a 1,000 acre parcel with no immediate potential is going to be looked at with much less favorably than a 5-acre parcel zoned for residential development. If there are any improvements already on the property – even something like a cabin, pole barn, or mobile home, it can increase the odds of loan approval because there is additional collateral. If the surrounding area is developing, that makes the collateral more secure to the lender. Development puts upward price pressure on the land, making the collateral more valuable as time marches on. The terms of the loan play an important part in approval for a land loan. Lenders consider financing factors such as the down payment, interest rate and duration of the loan. The more you are willing to put down the more likely you’ll get the loan approved because it increases lender’s security. The main reason why land loans can require upwards of 50% down payment is so the lender has a 50% equity cushion in the event they need to foreclose and sell the property. The more interest you are willing to pay, the more likely a lender will fund your loan. Of course, you have to consider the effect of interest on your payment and what you can afford. The shorter the duration of the loan, the more the lender will prefer it. It’s easier to get approval for a 5-year or 10-year land loan than a 30-year one. It’s likely that your land loan will have a balloon payment. 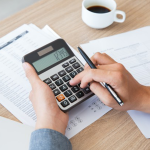 That means while your payments may be calculated on a 15- or 20-year term, the whole remaining balance will be due at the 5-year or 10-year mark. Lenders will factor your ability to either pay that balloon or refinance the balance as part of the scrutiny for the loan. If you are willing to put up additional collateral to make the lender more secure, the more likely you’ll get the loan approved. The financial situation of the borrower will also be considered, and because land loans are many times not income-producing, the borrower’s credit and financing may take center stage over other factors. As with any loan, the creditworthiness, borrowing history, and history of loan repayment will play a great role in whether or not a land loan is approved. Since so much land is not income-producing, lenders look to the borrower’s other income as a primary means to make the payments. What mortgages and loans available for land are ultimately determined by the nature of the property itself. There are agricultural land loans, timberland loans, raw land loans, recreational land loans, lot loans, and construction loans for parcels on which building is already planned. Agricultural Land Loans – these are available for farmers, dairy operations, ranchers, etc. to purchase the land they need for their livelihood. Because the land is productive and producing income, these are among the easier land loans to obtain. Agricultural loans are readily available in rural communities. Timber and Mining Land Loans – these are similar to agricultural loans in that the land will produce income. They are riskier for lenders, though, in that income either has a fixed duration as it will have with mining, or will have long durations between harvests in the case with timber. Land Loans for Energy Production – If a parcel is intended for oil or gas production, wind farm, solar, etc. a land loan may be relatively easy to obtain because it will produce ongoing income. Raw Land Loans – these loans among the most difficult to obtain because the collateral is not productive and may not appreciate in the near term. Recreational Lot Loans – used for parcels intended for hunting, vacationing, etc. Similar to raw land loans, these are relatively hard to obtain because the collateral is perceived as being risky and easy for the borrower to walk away from. Lot Loans – Lot loans are used for small parcels ultimately intended for constructing a building. Lot loans are most often approved for previously subdivided lots in residential or commercial areas, although availability typically extends to identified lots in more rural areas. Leased Land Loans – In certain cases, the land is intended to be leased. The most common in this category are parcels intended as mobile home developments on which residents will pay a ground rent. Because these are income producing the loans are fairly easy to obtain. 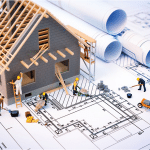 Construction Loans – these loans are based on plans to construct a building in the near-term which actually improves the security of the underlying collateral. Because of that, construction loans are among the easier to obtain and readily available. Obtaining a land loan is different from obtaining a traditional mortgage because lenders consider the collateral less secure and the loans riskier. Lenders will typically seek higher down payments, higher interest and fees, and shorter durations. Lending options depend on the nature and use of the land, with preference placed on productive land rather than undeveloped raw land.